Today I'm channeling my inner Family Feud... Name three states that are synonymous with College Football. Chances are the answers would be Texas, Florida, and California and most likely in that exact order right? Well in 2012 the landscape of college football in the state of Texas is changing and that's why No. 94 on our College Sports Bucket list is a game you may not have thought of yet. I suppose I should start off by telling you that you won't be seeing Texas vs. Texas A&M in this spot or anywhere in our list. Why? Because currently this game isn't going to be played anytime soon. Kinda hard to fulfill a bucket list item when the game doesn't exist, huh? While we're at it we might as well dispel a few other games you may be waiting for that won't be on this list (we reserve the right to put them on a future list if we do it again & they are being played). Nowhere on the list are games like Missouri vs. Kansas (football/basketball), the BCS Title game (could be dead sooner than later), and West Virginia vs. Pitt (football/basketball). It's a shame in two of those cases as they would've ranked high on the list, but personally I'm thankful that the BCS Title game won't be on the list. It means we're one step closer to a true national champion being crowned. But I digress, let's get back to the reason we are here: Our staff wide Bucket List!! Let's face it, football is KING in Texas and the whole country knows about it. But like I stated above the landscape of football in the state is in a state of flux and gone are the days of Texas vs. Texas A&M as A&M bolted for the "richer" pastures of the SEC. 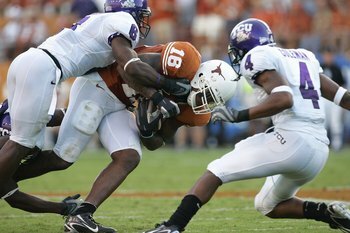 That decision won't negate the hate between the two biggest schools in the state, but it does bring about a renewed rivalry from way back in the day and that's Texas vs. TCU. These two schools were former members of the classic Southwest Conference from 1927-1996 and once that broke up the Horned Frogs were left out in the cold of Conference-USA while the "big time" program of Texas began it's stint in the Big XII. Overall Texas has a commanding 61-20-1 record over TCU, but don't let that fool you. These two schools are in vastly different positions from where they were when they last were in a conference together. Texas is struggling to live up to lofty expectations, having lost to Iowa State at home for the first time in school history just a few years ago on it's way to a losing season and then struggling for bowl eligibility last season, going 8-5. However, they were just 4-5 inside the Big XII. TCU is a school that's been on the rise. They've been in the national title picture for a few seasons now and they... as painful a memory as this game is for us Badger faithful.... won the 2011 Rose Bowl. Add in the fact that the Longhorns will be looking for another 2nd rival, after Oklahoma of course, and you have the ingredients of a good rivalry. No matter if it turns in to one, seeing two Texas schools battling it out should be on any College Sports fans lists of things to do. It may turn out that Baylor and TCU become bigger "rivals" in the end due to the backgrounds of the colleges and that amazing game they played early on last season before even being conference foes, but we're sticking with the "Big Brother" vs. "Little Brother" in terms of longer term success as the game to see.